Democratic Congresswoman-elect Alexandria Ocasio-Cortez doubles down on comparison between illegal immigrants and Jewish Holocaust refugees. Congresswoman-elect Alexandria Ocasio-Cortez, who is set to represent New York’s 14th congressional district in the US House of Representatives next January, doubled down on her comparison between Jewish Holocaust refugees fleeing genocide in Europe to illegal immigrants making their way towards the US in the so-called “migrant caravan”. Ocasio-Cortez, who at 29 is set to become Congress’s youngest female lawmaker ever, sparked controversy on Monday when she compared illegal immigrants from Central America who attempted to cross into the United States over the weekend in what has been dubbed the “migrant caravan” with Jews attempting to escape Nazi Germany. “Asking to be considered a refugee & applying for status isn’t a crime,” tweeted Ocasio-Cortez. “It wasn’t for Jewish families fleeing Germany. It wasn’t for targeted families fleeing Rwanda. Thousands of migrants from Central America crossed into Mexico illegally earlier this month, on their way north towards the US border. While some Democratic lawmakers claimed the migrants were fleeing violence and oppression in their home countries and should therefore be recognized as legal asylum seekers, conservative critics of the caravan – including President Trump – have cited local officials in Mexico who claim that many of the migrants are violent criminals, pointing to attacks on border patrol positions along the US-Mexico frontier over the weekend. 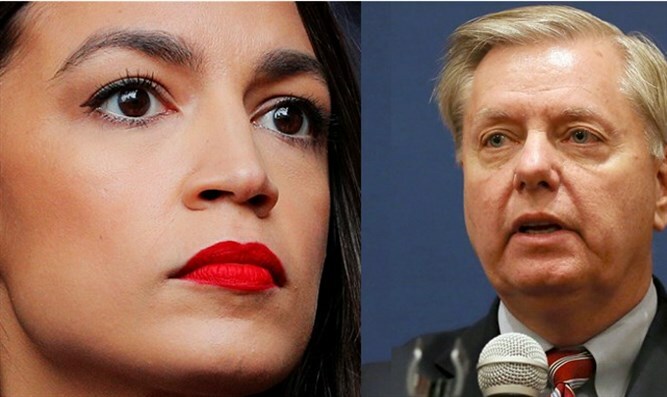 South Carolina Republican Senator Lindsey Graham chided Ocasio-Cortez for comparing the migrant caravan to Jews fleeing genocide in Europe, advising her in a tweet to visit a Holocaust museum. Early Tuesday morning, Ocasio-Cortez doubled down on her comparison, saying the lesson of the Holocaust was relevant to the Trump administration’s handling of illegal immigration. “Lindsey Graham, the point of such a treasured museum is to bring its lessons to present day,” Ocasio-Cortez tweeted. New York State Assemblyman Dov Hikind, a Democrat, also criticized Ocasio-Cortez for comparing illegal immigrants to Jewish Holocaust refugees. "Alexandria Ocasio-Cortez gets the ignorance award. Someone should educate her about precisely what the Holocaust was all about," Hikind tweeted.